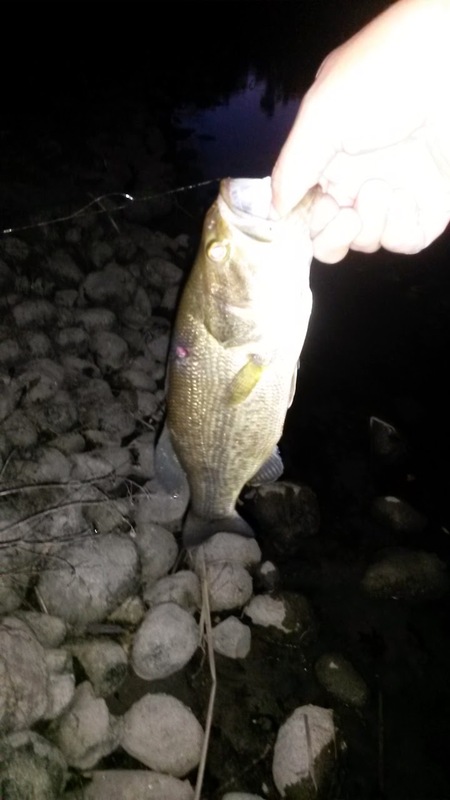 Breaking the Bank: First Fish of the year! February 26 was a good day. It was a quick after work trip but it was fruitful. For those of you that follow me regularly, you know that this year I have committed myself to learning more about fly fishing by fly fishing more; what a concept. 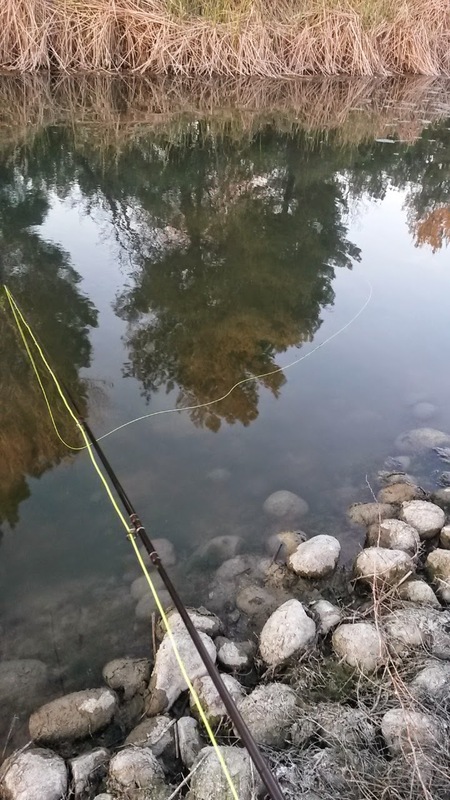 Specifically, that means that most of the time when I am out fishing, I will be taking my fly rod instead of my spinning rod and putting myself in positions where I have no other option but to fly fish more. After this trip, this decision has been completely justified. This was a last minute trip that I almost canceled because of work. As it turns out work ended up not getting in the way so I called up Jeremy and our trip was back on. This was before daylight savings time so we had about 2 hours to fish. We arrived at a park pond in Davis that I will refer to as “Davis pond,” at about 4:30. I assembled my 6 wt and went to work testing areas of the pond that looked fishy. It is a small pond so the walk around the pond wasn’t too bad. I finally found an area close to an island surrounded by cattails at the center where there seems to be a steep drop off into deeper water. So while others were fishing the main body of the pond, I went to work on this drop off with a black wooley bugger… no takers. After a while I started noticing mosquitoes landing on top of the water. I quickly looked through the flies I had on me and the closest thing I could find to a mosquito looking pattern was a light cahill. I gave it a try and no takers as it sat on top of the water… but then it sank. After a few seconds, I had a taker! 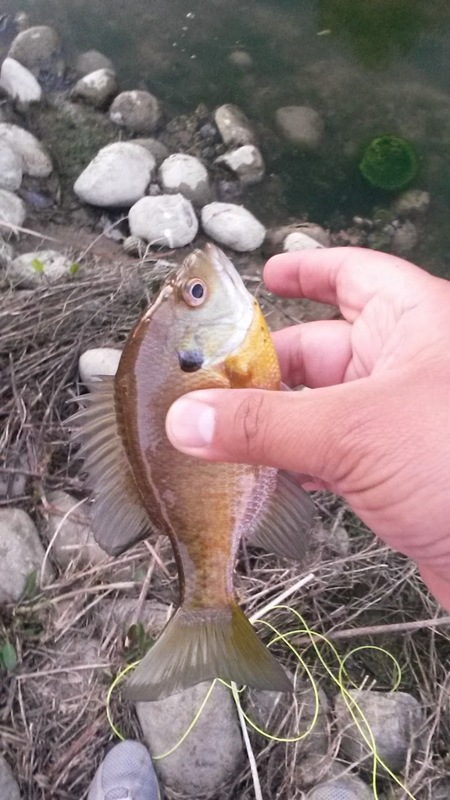 A few moments later I brought the first fish of the year to hand, a small bluegill. At one point, Jeremy, who I am teaching to fly fish decided he wanted to give the fly a try. 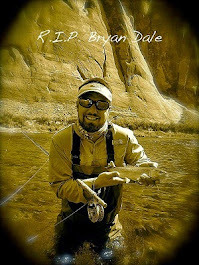 He took my fly rod and after a brief casting tutorial, tried to catch fish on the fly. Meanwhile, he hands me his fishing rod, a small 5 foot rod with 2 lb test line on it. It was rigged up with a texas rigged worm. I moved out of the way to give him room to cast and took the 5 foot rod. 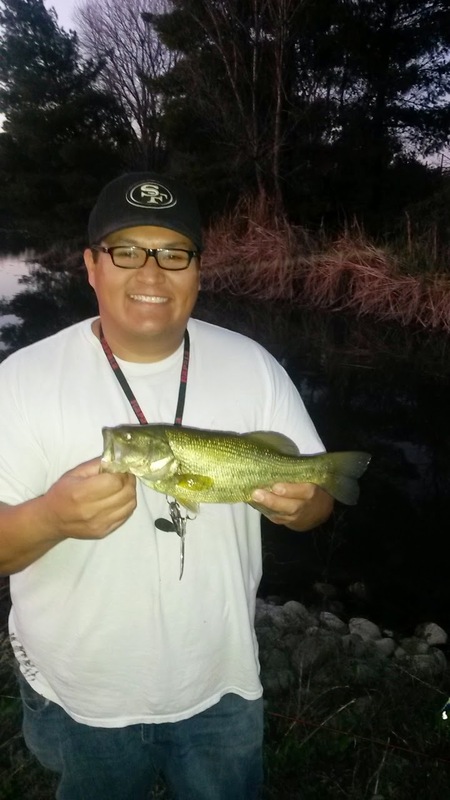 In my first cast I tossed the worm into cattails and as it bumped off of the cattails and hit the water, a bass took it in its mouth and I reeled the fish in! 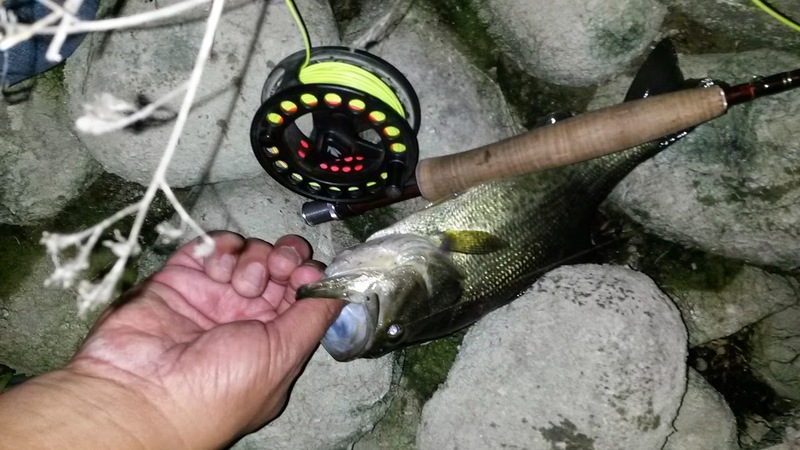 A nice 1 ½ - 2 lb fish. I continued to cast and ended up moving down to the main body of the pond. At one point I stated noticing the fish were surface feeding so I tossed my light cahill in that area. One fish ended up breaking off my fly so I tied on another and continued. I finally got one taker and brought in my third fish of the day, a nice little bass at about a pound. After that another fish broke my fly off and at that point it was too dark to tie on another. I ended the day having caught the only 3 fish of the day and all on the fly! 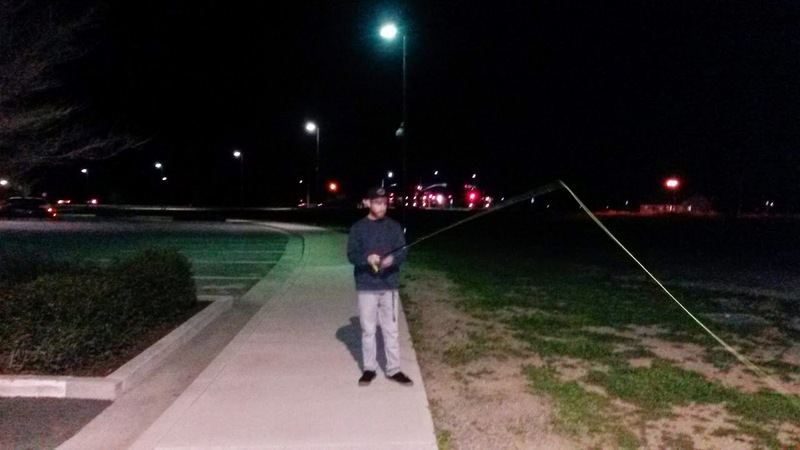 We ended the night with some casting lessons in a parking lot. Since then, Jeremy received a Cabelas wind river Combo as a birthday present and he is already talking about buying a float tube in the future. I think we have a new fly fisher on our hands, folks! Haha another believer in the gospel of fly fishing! Way to hang in there Juan. I find that hitting the local fly shop will help with learning what bugs are available in that area. Your catch will increase dramatically. That sounds like a great outing, Juan! Really awesome that you got your friend into the sport, as well. Those bass pics are making me real jealous, but the ice is starting to melt, so, I'm not too far behind. This post has me excited to get out on some open water. Glad your gaining confidence on the fly rod. Bluegills and bass are a great way to get started. I actually started my fly fishing in January about three years ago. It was pretty discouraging to get epic skunked trip after trip due to the season but I kept at it and the rest is history.